This book is also part of Data Science Central apprenticeship and is available on Amazon and on Wiley website. 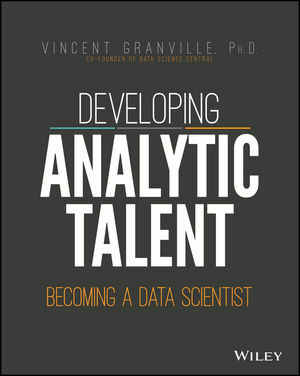 Data scientists are in demand, and this unique book shows you exactly what employers want and the skill set that separates the quality data scientist from other talented IT professionals. Data science involves extracting, creating, and processing data to turn it into business value. This guide discusses the essential skills, such as statistics and visualization techniques, and covers everything from analytical recipes and data science tricks to common job interview questions, sample resumes, and source code.